I was in love with Voltron: Legendary Defender from the first minute. Netflix and DreamWorks Animation have done an absolutely fantastic job of updating a show to make it new and fresh while still making it so nostalgic that it hit all the right buttons. Here is the full build write-up of the entire casual Keith cosplay. I am still in progress on his sword and paladin armor, so that will be a later write-up. 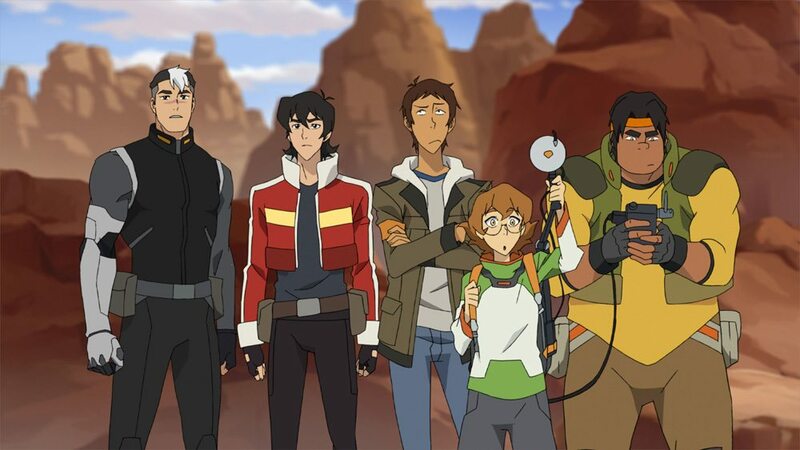 You can also listen to several of us GeekDads go in-depth about our love for the new Voltron on the Great Big Beautiful Podcast or my son and I discuss Season 2 and some of the new toys on our podcast, Sunday Evening with Captain Owen. My first task was to focus on the prop–Keith’s bayard and sword–because I knew it would take me the longest. Step 1 was to draw out a close approximation of what I thought the size and shape should be. It’s always challenging building a prop from animation, especially when the prop is not only magical and changes shape but is drawn differently almost every scene. You have to take some artistic license and make it your own! I then cut a really rough prototype out of some waste foam (just good old EVA foam floor mats). I tweaked the foam pieces a little bit here and there until I was happy with it, and then made new, finished paper templates based off of those. I like to color my templates in with Sharpies just so I can get a better visual idea of the parts. My son definitely approved! I decided that I wanted the bayard to be a little sturdier since its going to get the most wear and tear, so I took my template, scanned it, then created a vector version in Illustrator. I took the vector drawing into 123Design and modeled it in 3D. I then printed it out on my Dremel 3D Idea Builder and glued all the pieces together (it’s in four quarters). The size and shape matched up pretty well with my foam prototype! I did a couple of rounds of Bondo and 2-in-1 Filler & Sandable Primer. The hardest part of the prop build, for me, is the electronics. This is going to be my first prop that involves LED and lighting effects. Thankfully, my buddy Eric at Coregeek Cosplay and Creations tipped me off to these great little LED circuits. They are essentially little LEDs on a very malleable silver wire with a built-in battery pack. And the best thing, especially for a sword, is that its a very small form factor for fitting it into the prop. The paladin armor has a dozen or so lit pieces, so I’ll be using these there as well. I then ran over to my local Tap Plastics and picked up a small sheet of transparent light blue acrylic. The plan was to cut this up to make the light up pieces of the sword. I roughed it up a little with sandpaper and put some white tissue paper behind it to help diffuse the light. I really like the way it came out, and it was the perfect color! Keith has some pretty distinct, black, red, and white boots. I went to a couple of secondhand shops looking for old boots before I gave up and decided to just use a pair of old motorcycle boots I already owned. While they aren’t the perfect match, I think they worked out really well. I started by figuring out where all the lines on the boots were and then making templates with my craft paper. I then cut out the pieces with 2mm craft foam. I used red foam for the red parts and white foam for the white parts. Since they got sealed and painted, I could have used any color, but I like to try to match foam to final color so if there is any paint cracking or chipping during wear, it’s not as noticeable. All the foam pieces were glued on with Barge. Then I masked and painted the red and white parts with PlastiDip. I’m really happy with how these turned out despite not being the perfect boots. Keith’s jacket is also unique, so I knew from the beginning I’d be making it from scratch. I started off with a muslin prototype based on an Uncle Sam pattern I found–it was the only men’s half jacket I could find. I bought all the fabric while I was there–cotton twill seemed heavyweight enough for a jacket but also cool enough to wear to SDCC and DragonCon. As with my prop templates, I like to color my fabric just so I get a better idea of color and shape and proportion. Once I was happy enough with the first prototype, I sliced up the single pieces into the specific color blocks that I’d need to piece together. I then cut all of my new pieces out of muslin, adding in and taking away where I’ve marked on the original prototype. I also had to add in new seam allowance anywhere I needed to join two differently colored pieces together. Once I had the final prototype jacket done (with a few minor tweaks), I took it all apart again to use as my final pattern. I didn’t even remembering Keith having a dagger from my initial watch-through until I was hunting for some more reference photos. I quickly grabbed some left over PVC foam board from my Ashitaka sword sheath, cut it down to size, heat formed it to the right shape, notched the back so it could slide onto my belt, and then drew the pattern on it. The sheath looks like it’s a combination of leather and metal, so I added the “metal” bands using 2mm craft foam (glued on with Barge). I then used some leftover black PlastiDip to seal everything up. I decided to leave the black PlastiDip body as is as it looks a lot like leather. I then finished off the sheath with some Rust-oleum Metallic spray paint that I had left over from my Hylian shield. All of the pieces cut for the jacket and mid-way through assembly. After assembling the base jacket pieces and test fitting it (it fit perfectly! ), I had to do my first zipper. Well, I didn’t have to, but Keith’s jacket has what looks like white trim down the center of the jacket. I aim for function over form if I can help it, so I made it a zippable jacket. Also, I try to always line my clothes to give them a nice finish, but since I knew I’d be wearing this at SDCC and later at DragonCon, I wanted to keep it on the cooler side. I lined the collar and cuffs where untidy seams might be noticeable, but I left the rest of the jacket unlined (for now). Because I knew the dagger wouldn’t see much light of day, I built it entirely out of scraps of eva foam (yes, even the puzzle pieces). I took the dagger to my belt sander and free-hand sanded it down to the shape I wanted. I heat sealed it, sanded off the rough bits, and then coated it with black PlastiDip. I then took some leftover fleather strips I had from my old Steampunk cosplay and wrapped the hilt. I followed that with more heat sealing and more PlastiDip. For the blade, I did a couple of coats of Rust-oleum Metallic spray paint followed by a little bit of DecoArt Silver Spark Metallic Lustre Wax for the blade edge. I finished it off by using some acrylic paint for the straps to make it a little more realistic looking. I did a base coat of plain brown followed by a mix of green, rust, purple, and black for weathering and in the crevices. Of course, with Season 2 now out, we’ve gotten a much better look at the dagger, so I 3D modelled the full Galra dagger. It’s now available in my shop as blueprints, 3D printable files, and a 3D printed kit. Resin kits and fully finished versions coming soon! After a final coat of Bondo and 2-in-1 Filler & Sandable Primer, I was ready to start painting my bayard. I started off by masking all the white and red areas. Because I felt like the black under area and grip should be a bit more organic, I used black PlastiDip again. This not only gave it a nice thick coat, but it also made it a little spongy like the grip of a weapon should be. It also gave it a better hand feel. Once the PlastiDip had dried I masked it off again and sprayed the high gloss white areas, then masked it off a third time to do the high gloss red areas. For the rest of the costume, I bought a grey t-shirt, black pants, a brown webbed belt, and a couple of belt pouches to finish the look. I love the way everything looked all together. Believe it or not, because I was down to the last-minute before getting on a plane, I never even tried everything on together until I walked out the door to go to the con! The only things I changed between the first and second day was my hair and wearing my handkerchief around my neck. I don’t have much experience with styling hair and wasn’t too happy with my hair day one, but day two came out much better in my opinion. I’m going to try my hand at a wig for the first time for ECCC 2017 though. Because Voltron is a relatively new show, I only ran into a handful of other cosplayers at SDCC and the majority of them happened to be Keith as well! I saw one Hunk, and while I didn’t see her in person, I saw a picture of the cutest little girl as Pidge. I also got to meet and take photos with some of the crew and cast of Voltron (Tim Hedrick, Lauren Montgomery, Joaquim Dos Santos, and Emperor Zarkon himself, Neil Kaplan)! It took me awhile, but I did finally get them their own bayards too! For the most part, the cosplay held up really well. The biggest issue I had was that after two days of walking many miles in my boots, some of the foam peeled away from the base boots. I think I need to take some sandpaper to the boots first to make the Barge adhere better before re-attaching the foam. Also, my feet hurt–a lot. I’ve since repaired the boots and added gel insoles. Both have now survived several more cons without anymore peeling or soreness. The second biggest issue I had is that I dropped my bayard getting out of the car on day one! Dropping any prop on the asphalt is not going to end well. Don’t drop things on hard surfaces! My bayard was instantly “weathered” and while it wasn’t really noticeable, especially in photos, I knew it was there. As mentioned above, I am planning to finish off Keith’s dagger as well as also add his Galra sword as blueprints, 3D printable files, and a 3D printed kit with the possibility of resin kits and finished props coming later. The big thing I’m trying to get done before ECCC is Keith’s bayard sword. I’m working on finishing the blade and hooking up the aforementioned LEDs. Bill Doran over at Punished Props helped me with cutting out the acrylic pieces for the light-up windows. While I’m finishing this up, the bayard sword IS available in my shop, again, as blueprints, 3D printable files, and a 3D printed kit. If all goes to plan, I’ll be revealing the finished sword at or just before ECCC. At the Hasbro breakfast at SDCC 2016, I picked up a lightsaber and jumped into the video booth. I think Keith looks good with a lightsaber. Keith also got to be a Headmaster and Batman! Batman: Arkham VR was very intuitive to get the hang of, plus, you get to be Batman! It was really cool getting to suit up and look at myself in the mirror as Batman. I couldn’t resist flexing and watching Batman follow my lead. The game is a lot heavier on detective work than straight up fighting (though there is fighting as well). This is one of a very few games that actually make me sad that I don’t own a PS4 since it will be a PS4 exclusive. If you do have a PS4 and you like Batman, you have to get this game. It’s a real blast grappling around through the sky and hurling batarangs as quickly as you can. Your cosplay is so amazing! Your little description of how you made your boots helped me with getting started on making mine; and I honestly had no idea where to start. Thank you so much for putting this up! I am so glad it helped! I would love to see your cosplay when its all done! Thank you so much!! This helps a lot! I had no idea where I would start with mine and your description of how you made this was so helpful and I’m thankful for it!! And you even added links which I love about this post too!!! Thank you so much!! Hooray! I’m glad it helped! I’d love to see yours when you’re all done!